Woodbridge, VA---The Washington Nationals have announced the 2019 Potomac Nationals' Field Staff for the upcoming season. The trio of coaches remains the same from the 2018 squad, which fell in the Championship Game of the Carolina League Playoffs. 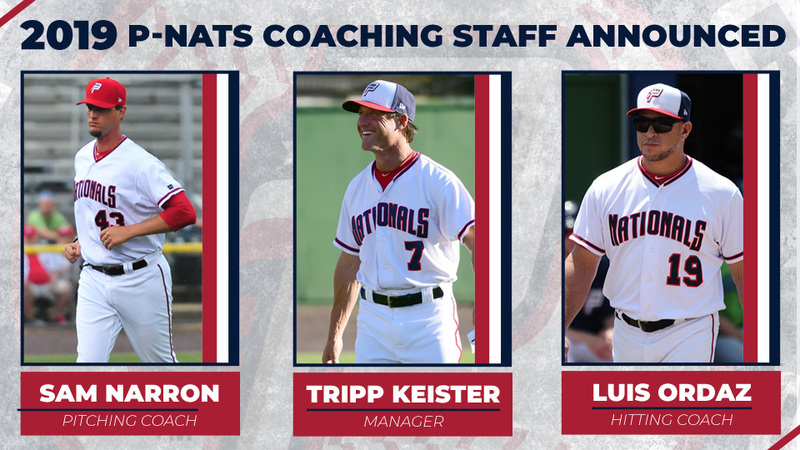 Manager Tripp Keister will return and lead the P-Nats for the sixth straight season, Luis Ordaz will come back as the hitting coach for the fourth consecutive season, while Sam Narron will serve as the pitching coach for the second season in a row. Athletic Trainer Don Neidig is set to return, while Strength & Conditioning Coach Shane Hill will be the only new face among the staff. The winningest manager in Potomac franchise history, Keister will enter his sixth season with the P-Nats with 353 regular season wins, 40 more than any other manager in franchise history, and 689 regular season games managed, seven shy of the franchise best. Keister will be the first manager in franchise history to lead the club for at least six consecutive seasons. At 48-years-old, Keister has managed at two other levels in Washington's system, Class-A Hagerstown, and the Gulf Coast League Nationals, and he appeared in 341 games over four seasons in the New York Mets' Minor League system. Ordaz is set to lead the offense for Potomac for the fourth straight year. The Venezuelan native will enter his ninth season as a coach in the Washington Minor League system. The 43-year-old has been the hitting coach for Hagerstown and the Short-Season Auburn Doubledays. An International Free Agent signed in 1992 by the Cincinnati Reds, Ordaz made 206 appearances at the Major League level between 1997 and 2006, with the St. Louis Cardinals, Kansas City Royals, and Tampa Bay Devil Rays. Narron rounds out the returning field staff, as the 37-year-old is set to guide the Potomac pitching staff for the second straight year. Narron's coaching career began with Auburn in 2012, and continued with three seasons with Hagerstown before he joined the P-Nats. The cousin of former MLB catcher Jerry Narron, and the grandson of former MLB catcher Sam Narron, the Potomac pitching coach made one Major League appearance with the Texas Rangers in 2004. Neidig wraps up the contingent of returning staff members from the 2018 Northern Division Championship squad, as he will serve as the Athletic Trainer for the second straight season. After four years with the Hagerstown Suns, the Lock Haven University graduate joined Potomac prior to 2018. The only new face to the Potomac coaching staff is Shane Hill, who will serve as the Strength & Conditioning Coach. A graduate of both Nova Southeastern University and the University of Florida, Hill has spent the past two seasons in the Washington system, in 2017 with the Doubledays and in 2018 with the Suns. The 2019 Potomac Nationals' season gets underway on April 4th at Northwest Federal Field at Pfitzner Stadium against the Fayetteville Woodpeckers (Houston Astros).